I think I’m a sucker for marine animals. And baby penguins are the newest addition to the gang! 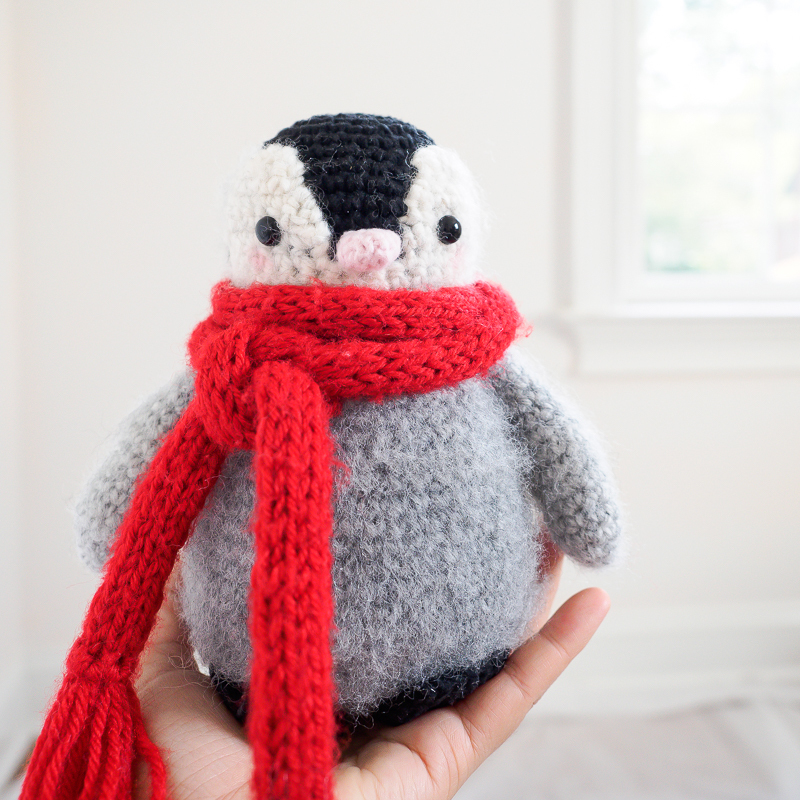 This baby penguin amigurumi is a ball of fluff, oozing coziness with his festive red scarf and ready to hand out warm hugs on cold winter days. As with Stanley Duck, I made more than one baby penguin toys so I could experiment with different yarns and different techniques. And like Stanley, each penguin came out with their own personalities. It’s so interesting to mix and match different types of yarn, with slightly different variations in weight and feel. The first penguin is mainly made from Lion Brand Scarfie Yarn. I am really drawn to the warm tones of the Silver/Cream colorway in Scarfie. This yarn is self-striping, which means it has swaths of silver that slowly transition into a soft cream, and then transitions back into the silver. I find the gray to be perfect for representing a penguin’s baby fuzz, while the cream softens the white areas of the face. And those color variations in the transitions are great for adding a bit of extra texture in an otherwise solid gray body. 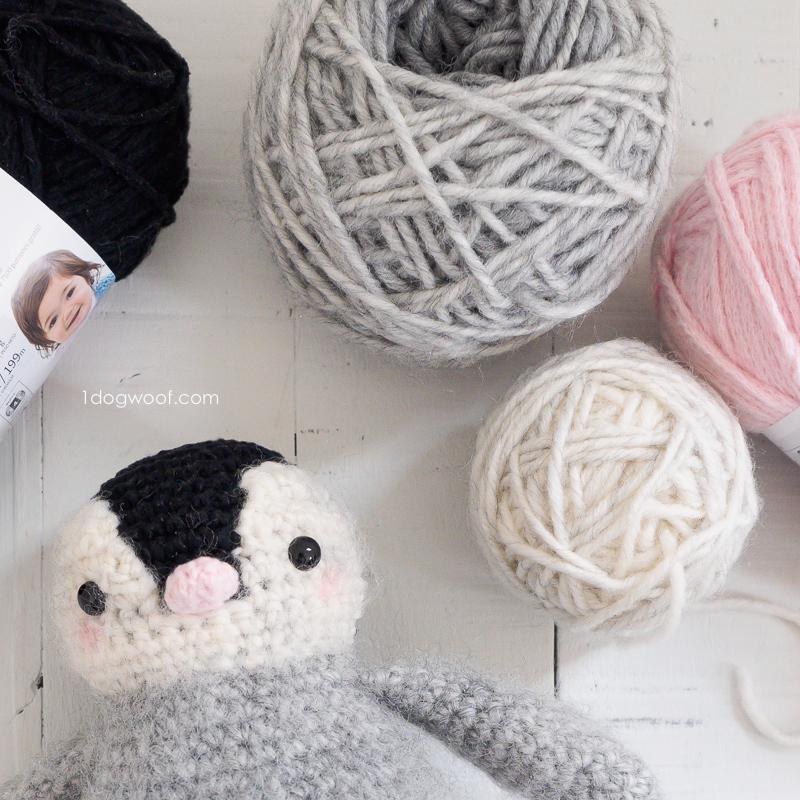 Best of all, because the yarn is a bit fuzzy to begin with, you can brush it lightly with a bristle brush to really bring out that soft halo look for a baby penguin. 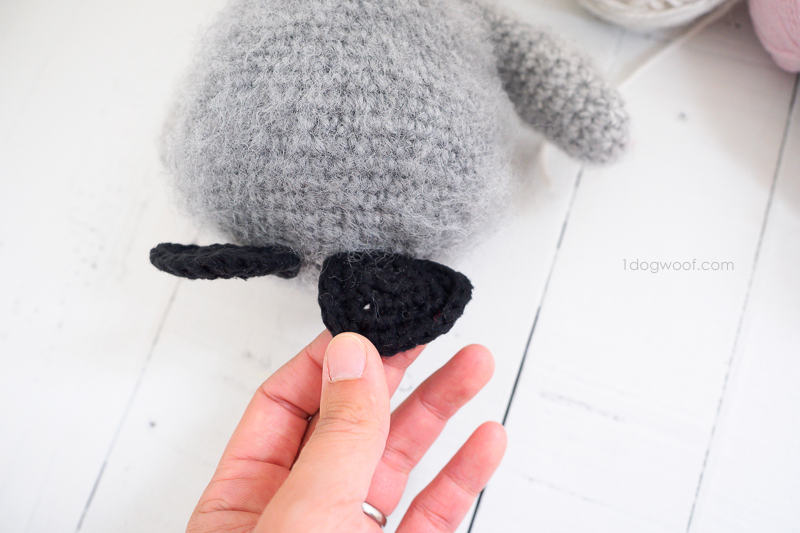 To use the Scarfie yarn, you need to separate the silver parts from the cream so they can be used for different parts of the penguin’s body. Some of the yarn in the middle of the transitions may be too light for the gray or too gray for the cream, and will end up not being used at all. Start with the end on the outside of the ball, not the one in the center. Unwind that yarn and rewind it into a cake until the color starts to transition. Here you’ll have to decide if you want to use the transition colors or not. You can keep winding, or cut out the transition bits until you get to a more solid cream or silver. Then wind up the next solid color into a separate cake. Since the penguin is so small, you’ll probably only need 2 cakes, 1 of each color, to complete the toy. I guess this isn’t the best use for a large skein of Scarfie, but I absolutely love the results. Scarfie yarn is a level 5 on the Craft Yarn Council Standard Yarn Weight System, which makes it slightly bulkier than the worsted weight yarns, which is level 4. However, each yarn weight level has their own variations, and I found that Scarfie works fairly well with a level 4 yarn, especially ones on the thicker side, like DIYarn or Vanna’s Choice. And DIYarn is only $0.99 per ball! Since the stitches worked up using Scarfie are fairly tight, I had no problem using the no-clump cluster stuffing for all the body parts. I find the no-clump stuffing works so much better for small parts and keeps everything squishy and extra huggable. Learn more about the types of stuffing I like to use for amigurumi in the video below. 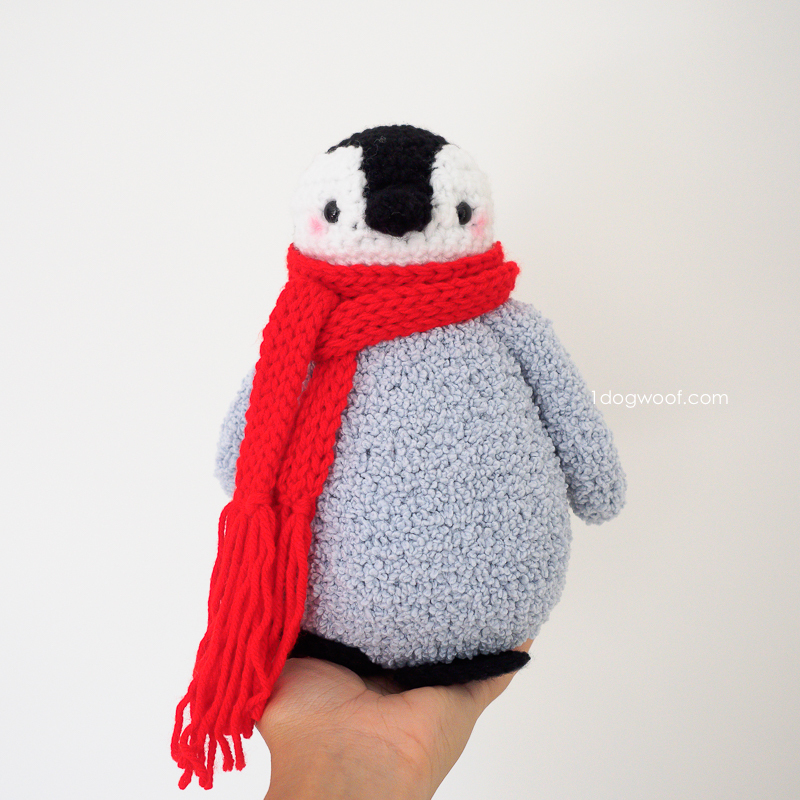 Once the whole penguin is put together, you can use a bristle brush to purposely fuzz up the Scarfie yarn. I have used a dog slicker brush like this one in the past for brushing out the beard in my Santa Amigurumi, but I couldn’t find it in the chaos of moving, so I just used my bristle hair brush (similar to this brush on Amazon), and it worked just as well! You want to brush in small, short strokes, purposely snagging the yarn and bringing up the fuzz in the yarn. Brushing in too long of a stroke makes the fuzz clump together, which you don’t want. Instead, you just want to see a slight halo effect all around. You can brush the body, the arms/fins, and even the head where you used Scarfie. 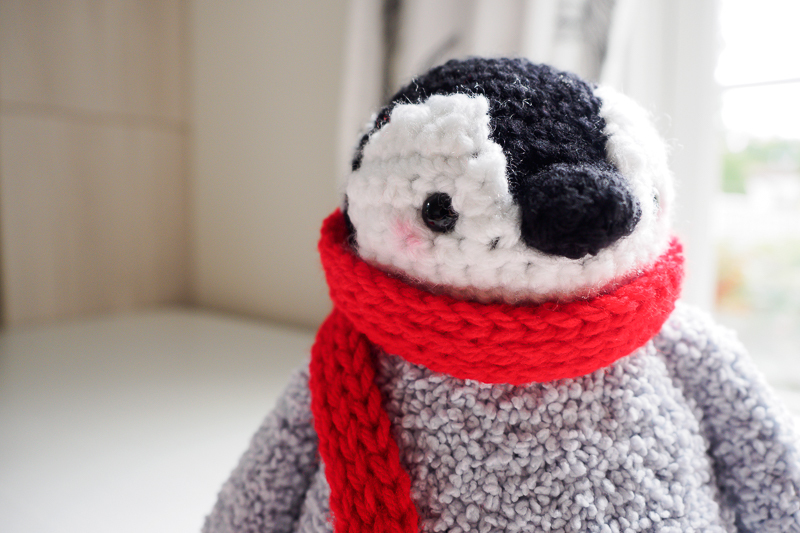 DIYarn, and Vanna’s Choice will not fuzz up as well in this case, so just stick to the Scarfie parts, and you’ll have a baby penguin that just oozes winter coziness! Over the summer, I made Stanley Duck using Lion Brand Baby Soft Boucle, which is a yarn with tiny loops on it and a soft chenille feel. It worked great for Stanley and I thought to try it on this penguin as well. The Baby Soft Boucle gray colorway is a much cooler gray tone than the Scarfie silver. It’s almost a grayish blue, so it’s best to find a yarn in a cool white, like DIYarn in White, to match the cool undertones. In case you’re wondering, I chose not to use Baby Soft Boucle in White because the face doesn’t need to be as fluffy as the body. And any worsted weight yarn in Black will work for the head. Here I used DIYarn in Black. Working with boucle yarn can be a bit of a challenge, as it’s much more difficult to see the stitches you’re working in. You have to feel your way to each stitch, and to find the working point of each single crochet with your fingers instead of your eyes. It’s much easier to do this when the stitches are large and loose, but since we’re matching up to worsted weight yarn in the head, and the whole thing needs to be stuffed, the boucle needs to be worked in the same hook size and stay fairly tight. 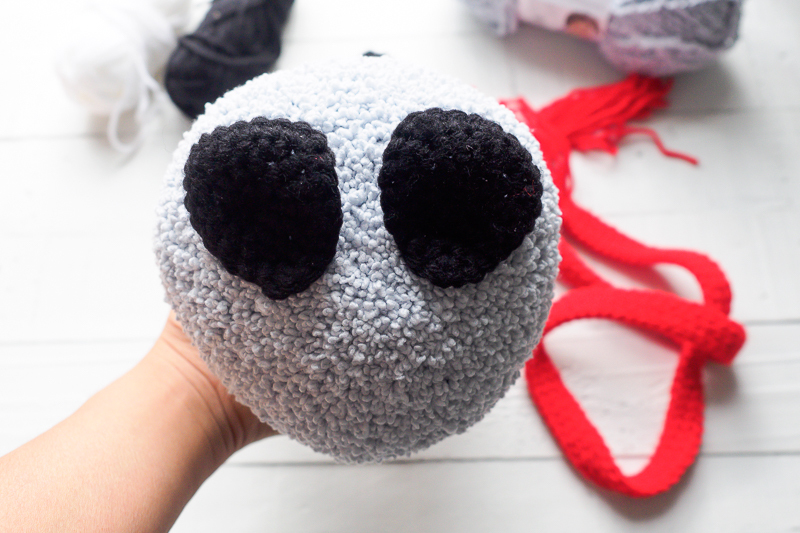 Below is a video to show how I worked with Baby Soft Boucle for Stanley Duck, how I used stitch markers to help me identify the beginning and end of each round, and how I feel for each stitch around. The gauge I used on Stanley was much looser than the one I used for the penguin, and that’s just a matter of learning to work with the yarn each time you use it! If you work your Baby Boucle body stitches tight enough, you can still use the no-clump stuffing for the body. For me, I know the stitches are not nearly as tight as the ones I used when crocheting with Scarfie, and that these penguins will be hugged so much, I chose to use regular polyfill stuffing to prevent any stuffing from coming out any loose Boucle stitches. The regular polyester fiberfill also works well to give this larger penguin more shape, since the Boucle body is much more floppy than the Scarfie body. In this case, once you’re done with the penguin, you’re done! There’s no brushing needed, since the Baby Boucle already has the “fuzzy” look built in! For both penguins, you can add a spot of blush to the cheeks to give it the feeling that it just came in from playing in the snow. I know some people use makeup blush, but I realized I don’t have any! So, I dabbed a bit of lipstick onto a q-tip, put a small dot of it on the penguin’s cheeks right below and slightly outside of the eyes, then used my finger to blur it in. That extra touch makes it so much sweeter, doesn’t it? 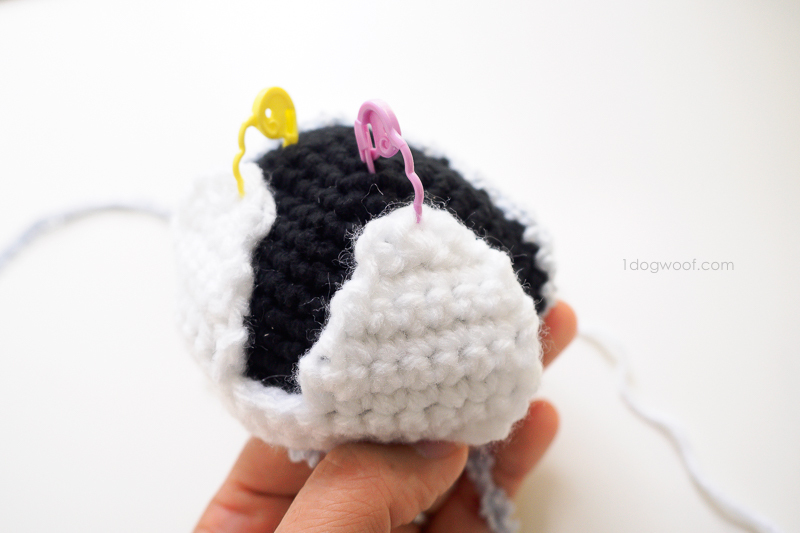 Below, I’ve shared the full pattern for the baby penguin amigurumi. Both penguins use the same pattern, the only difference is the yarn used. 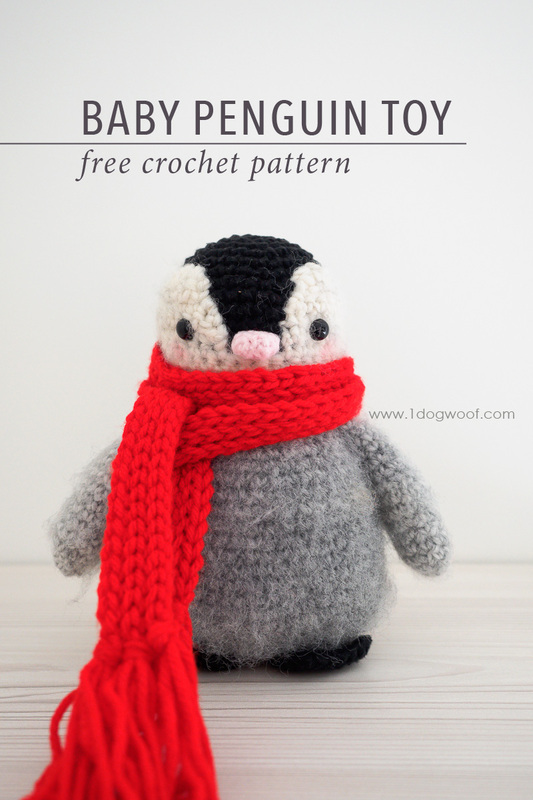 You can make this penguin using yarn from your stash, or if you’d like, you can purchase the Baby Penguin kit from Lion Brand Yarn which includes all the yarn you need to make the Baby Boucle version of the penguin, along with printed pattern instructions. 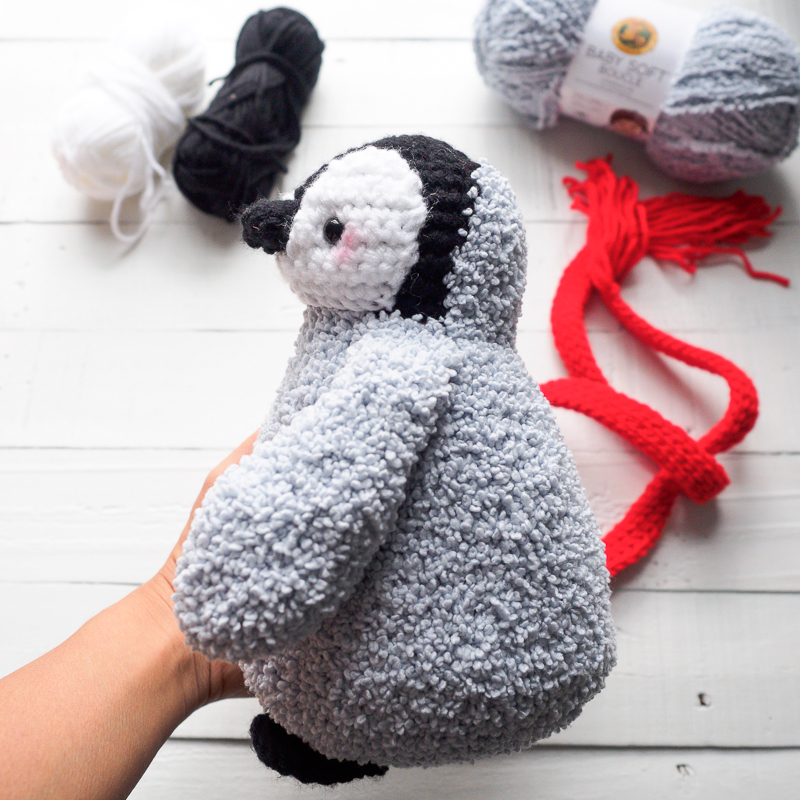 The kit actually comes with enough yarn to make 2 penguins, complete with the red scarf! You can also purchase a PDF of the pattern from my pattern shops for easy downloading and printing. Add to your queue on Ravelry or purchase from Ravelry. 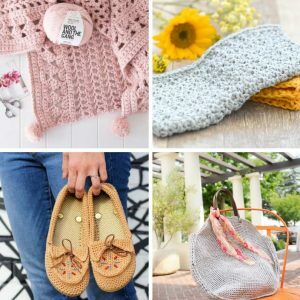 If you’re a sucker for marine animals like I am, you might enjoy a few of these other crochet patterns for water-loving creatures. What other animals am I missing from my aquarium? Hop onto Instagram and let me know! 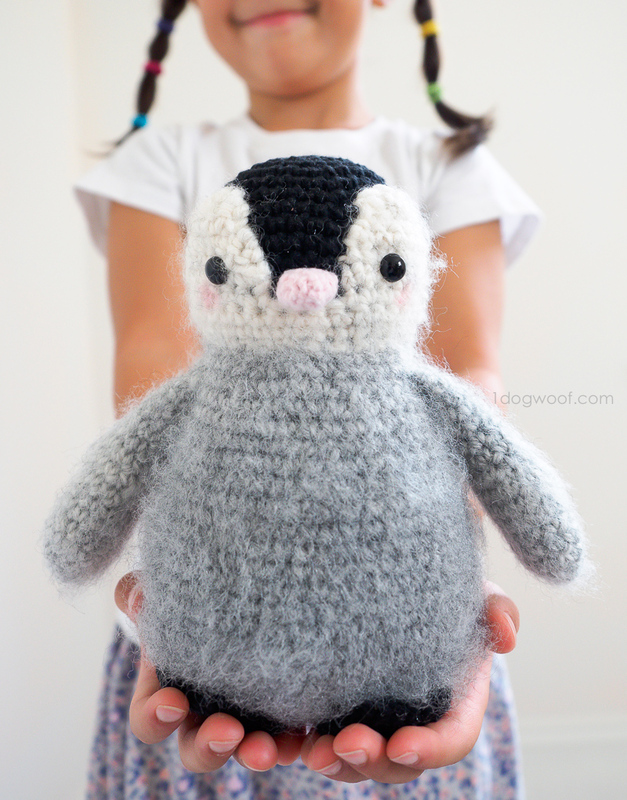 Baby Soft Boucle penguin is approximately 10 inches high. Scarfie penguin is approximately 8 inches high. Body parts are worked in continuous rounds, joined rounds or turned rows as indicated in the pattern instructions below. Make sure to secure the magic circle with a small knot before weaving in ends. You can use a smaller hook to achieve a tighter gauge. Add stitch marker on last st to indicate the back of the body. Fasten off the GRAY, leaving a long tail for sewing to the body. Row 1: (Leave a long tail for attaching to the head) Ch 16. Turn. Row 9: Do not work a chain. Work 3 hdc in 3rd st. Sl st in last st. Starting with a standing sc at the other outer edge after Row 3, repeat Rows 4-9 to make the other eye “patch”. Fasten off and weave in ends. Fasten off, leaving a tail to attach nose to head. Use the beginning tail to sew/close up the front of the nose and weave in ends. Fasten off, leaving a tail to attach to body. Squeeze round together to close the fin: Working through all 4 loops, work 4 sc across. Position the face centered on the black part of the head, with the bottom of the face lined up with the bottom of the head. Use clips or stitch markers to hold in place if necessary. Sew the face to the head using a whip stitch. Once the face is secured to the head, sew the nose directly to the black part of the head, in between the two white eye patches. You can create a round or oblong nose based on how you sew it to the head. Do not stuff the nose. Attach the safety eyes between Rows 5 and 6 of the face, approximately 3 stitches in from the inside edge of the eye patch. The eyes are positioned slightly higher than the nose. The stitch marker added at the end of the BODY section indicates the back of the body, so the front of the body is the side of the triangle opposite the stitch marker. Align the front of the head with the front of the body. Sew the head to the body using the mattress stitch, stuffing the head before closing the seam. Align the fins on either side of the body, one row down from where the head joins the body. Sew the fin to the body. Sew the feet to the body. Make sure to keep the slip stitches loose! Row 1: Ch 119. Turn. Row 2: Starting from the 2nd ch from hook, work 1 sl st in each ch across. Turn. Row 3: Ch 1. Work 1 sl st into the back loop of each st across. Turn. Row 4: Ch 1. Work 1 sl st into the back loop of each st across. Turn. Row 5: Ch 1. Work 1 sl st into the back loop of each st across. Turn. Row 6: Ch 1. Work 1 sl st into the back loop of each st across. For the fringe, cut 18 lengths of yarn, each approximately 8 inches in length. Holding 3 lengths of yarn together for each set of fringe, knot 3 sets on each end of the scarf. After tying, cut ends evenly. Use a small paintbrush to add a bit of blush (blush or lipstick works!) below the eyes. Very Cute! I am planning to make this as a present for my niece. Thank you for sharing it with us. This is the cutest thing ever! I wish I had the patience to knit something so detailed! I am stuck on the head part. Everything else is fine. It works in the round so how is the black separated around the eyes? Please help! I’m not sure what you mean. There’s a white section that’s made separately and sewn onto the black part. I love this new pattern! Thanks. Have successfully completed the body and the fins but I can’t work out the head. For some reason, the grey doesn’t seem to look right. I can’t get it symmetrical. Is it supposed to be symmetrical?? Can you please post a picture of the back of the head so I can see what it looks like? Thank you. To be honest, these directions were as symmetrical as I could get it. Mine isn’t perfectly symmetrical either. Let me see if I can find a picture and update the post. i don’t know if you have stumbled upon this before but someone else is selling your pattern. I’m having the same issue with the back of the head. The grey is staggered through the black. Please post a picture of the back of head please! I’m having the same problem with the head…the grey gets all weird on the left side. Any suggestions? 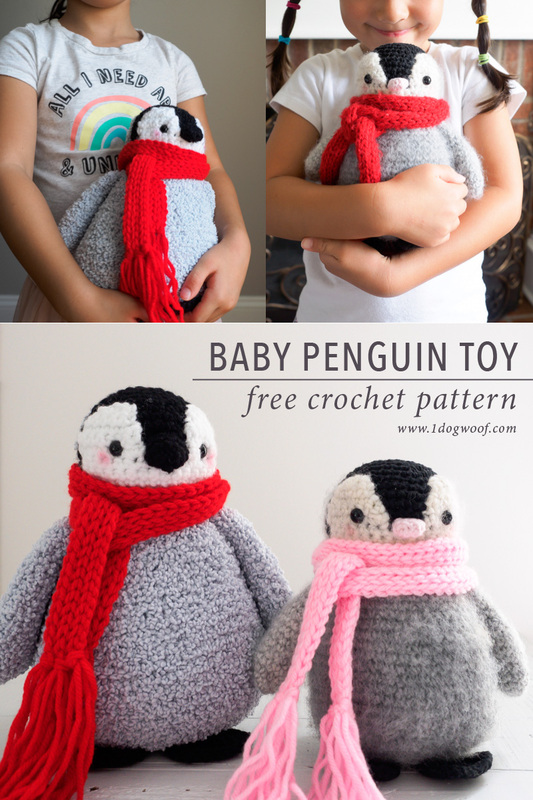 Planning to make this for my daughter for Christmas, as she loves Happy Feet. Is this pattern using Uk terms or USA terms? I am having a hard time finding the wholes. My count was totally off, so I ripped it out and began again. Then I went on the Web and found your video showing how to use the boucle yarn. However, you used a larger crochet hook there. I thought maybe the pattern which came with the kit was wrong so I bought another one. Of course, it still uses the size H. I am trying again, but still struggling. What would happen if I used a larger hook? Hello! I am having great difficulty on the head, as well. I keep ending up with almost a “cinnamon roll” look with the gray and white… any idea what I am doing wrong? Are there step-by step photos available at all? Thank you so much for this pattern. 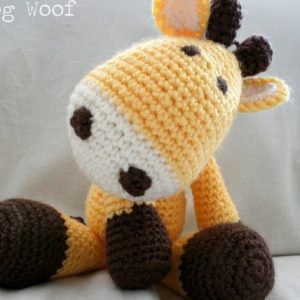 This was my first crochet animal attempt, and I found your instructions very easy to follow. I love all of your designs. My niece loves polar bears. So, I thought this little guy would be perfect for her collection. I also chose a homespun type of yarn which was very difficult to keep count. The key for me was using my stitch markers and a bunch of them! Lol once I did that, I was never off on the rows. Thanks again! Did you ever get help on the head ? I’ve ripped it out numerous times! Getting frustrated….